Heaven on Earth a.k.a. Videsh is a 2008 Canadian film directed and written by Deepa Mehta. 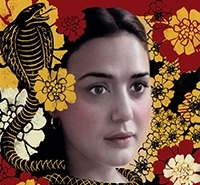 Preity Zinta plays the leading role of Chand, a young Indian Punjabi woman who finds herself in an abusive arranged marriage with an Indo-Canadian man, played by theatre actor Vansh Bhardwaj. The film released in India dubbed into Hindi under the title Videsh. Fire (Hindi: फायर) is a 1996 Indian-Canadian romantic drama film written and directed by Deepa Mehta, starring Shabana Azmi and Nandita Das. The film is loosely based on Ismat Chughtai's 1942 story, Lihaaf (The Quilt). It is revealed that Radha faces a similar problem.